This was one of the more anticipated workshops of the year, one that’s been in planning since December when we happened to meet Keith. Keith has been making his own sourdough for at least 17 years, much to the delight of his family and friends. It was most gracious of him to agree to not only teach us how to make a mouthwatering loaf, but to share his sourdough starter – the mother. Due to time constraints, (sourdough bread first prove takes about six hours) Keith brought three loaves already baked, and one ready to go into the oven. 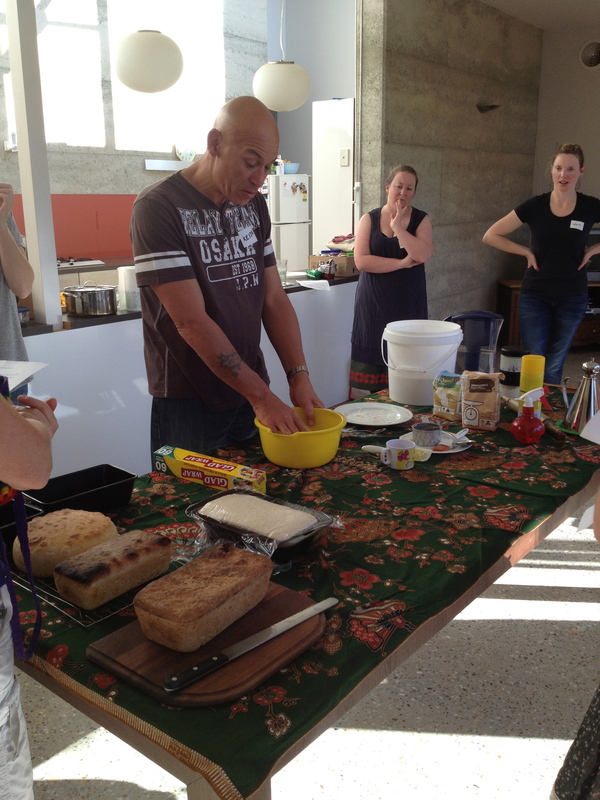 He also took us through making a loaf from scratch. Since it was winter and nobody needs an excuse for soup to go with really fresh bread, we also had soup. Two different kinds: tomato and leek and bacony pumpkin. To make your own sourdough bread, you’ll need two cups of sourdough mother, to which you add another two cups of organic flour. Stone ground is best, but don’t put more than one cup of wholemeal flour in unless you like quite a heavy loaf. Add one teaspoon each of salt and sugar, mix with your hands, adding a little more flour if the dough is too sticky. Knead lightly on floured board, then rub the inside of your mixing bowl with a little oil, put the dough back in the bowl, cover with cling film or a wet tea towel and leave it to prove. Keith suggests you do this bit before work, leave it to prove while you’re at work and it should be ready for the next step when you get home. 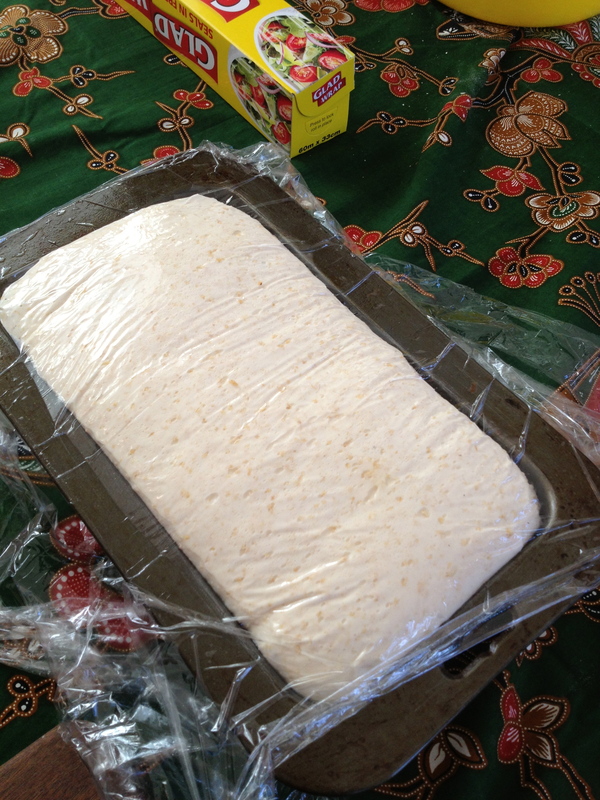 Knock the dough down and give it a light knead, then put it in an oiled or floured loaf tin, cover with damp cling film or a wet tea towel and leave it another hour or two to double in size. When it’s twice its original size, bake about 25 minutes in a 260 degree oven. You’ll know it’s done by the gorgeous smell coming from your oven, it’s golden and crisp on top and sounds hollow when you tap it. 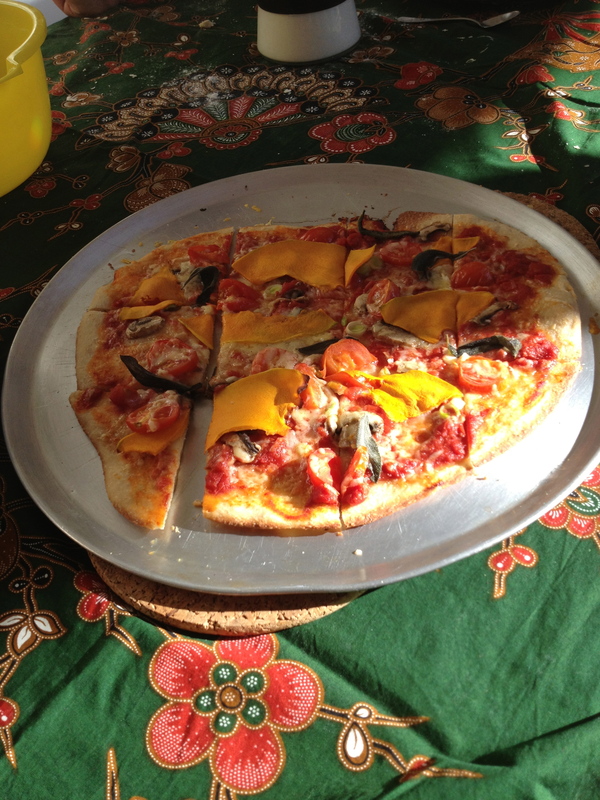 If you happen to have a bit of leftover dough, this makes excellent pizza! Saute leek in butter with a bit more thyme until it just starts to caramelise, stir through finely chopped preserved lemon. Add tomatoes, then stock and simmer for about 20 minutes until all vegetables are thoroughly cooked. Whiz in the blender (or with a stick blender) adjust seasoning and serve with fresh sourdough bread. This entry was posted in Event, Food, Kitchen Gardeners and tagged Cooking, Making sourdough, soup recipe, Tomato & Leek soup. Bookmark the permalink.